England's Stuart Broad celebrates as New Zealand's Trent Boult is caught by Moeen Ali. 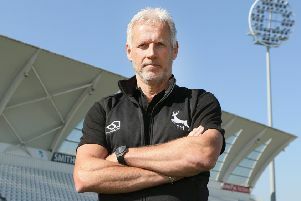 Cricket’s version of The Big Reunion show will take place on Friday when Notts Outlaws meet Leicestershire Foxes at Trent Bridge in the NatWest T20 Blast competition. Four players in the home squad will be hoping to line up against their former county in an eagerly anticipated East Midlands clash. England’s Stuart Broad, released to play by the ECB, will be in line to make his first T20 appearance for the Outlaws since Finals Day in 2010. His only other white ball outing for the county since then was the Yorkshire Bank 40 Final in 2013. Broad’s team-mates are likely to include James Taylor, Greg Smith and Harry Gurney, all of whom began life as a county professional at Grace Road. The 28 year old also had to sit and watch when the Foxes won the third of their domestic T20 titles in 2011, having been ruled out through injury. His move to Nottingham, the city of his birth, had already been confirmed but he was allowed to go off and represent the Foxes in that year’s Champions League event. Gurney is hoping that a decent performance or two in the next couple of Blast matches might see him return to the international fold, after being omitted from the ODI squad announced this week.